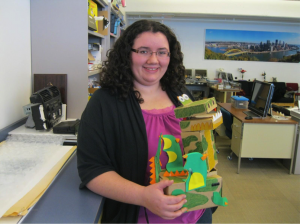 Jennifer, at the CREATE Lab, with a Hummingbird Kit robot that she created for teacher professional development workshops. Jennifer joins the CEEO after completing her M.S. and Ph.D. in Robotics within the Community Robotics, Education, and Technology Empowerment (CREATE) Lab at Carnegie Mellon University where she worked to develop the Arts & Bots Program, a creativity-oriented, middle school robotics program using the Hummingbird Robotics Kit. Dr. Cross was a fellow of both the Institute of Education Sciences supported Program for Interdisciplinary Education Research and the National Science Foundation Graduate Research Fellowship Program. Jennifer in her sixth-grade science fair presenting School-Bot, a robot courier for schools, built with LEGO MINDSTORMS. 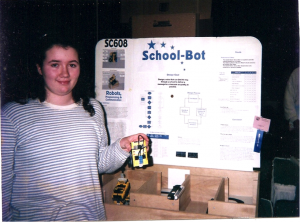 She is still interested in developing robots for schools almost two decades later. 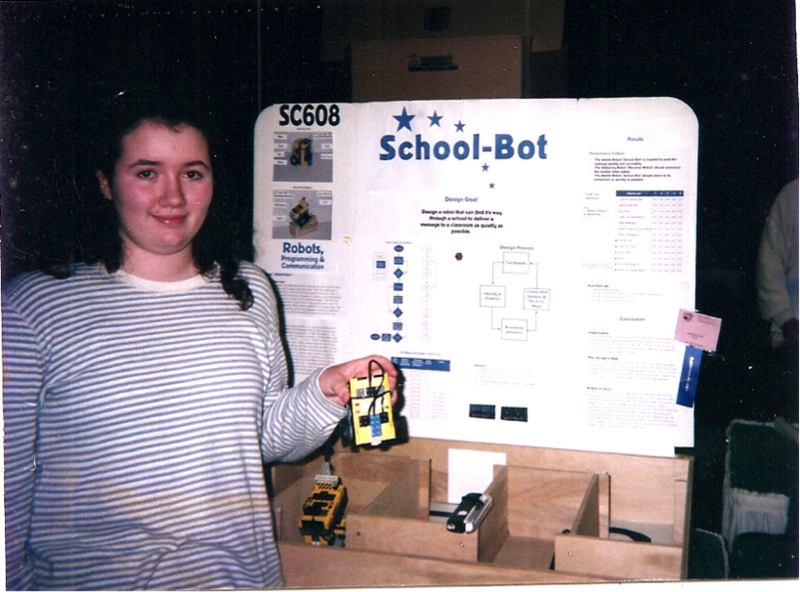 Jennifer’s interest in robotics started at a young age while she was growing up in rural central Pennsylvania watching robot movies, such as “Short Circuit.” However, a LEGO MINDSTORMS kit was what really cemented her passion for robotics. This passion eventually led her to study electrical and computer engineering at Olin College in Needham, MA. Outside of robotics, Jennifer also loves reading, gardening, painting, and creating fused glass art. Entry filed under: CEEO Updates, Uncategorized. Tags: .